Stuart attended the Lakefield Public School from 1920 to 1928; the Lakefield Preparatory School from 1928 to 1933 for Middle and Upper matriculation; Shaw’s Business College from 1933 to 1934 to complete an Office Training Course and then Central Technical School in Toronto in 1938 in Diesel Engineering and received a Certificate for Diesel Engineering. Harding Stuart's pre-enlistment employer was Lake Caswell Mine Company where he worked for the General Manager in Toronto up to enlisting in 1940. Harding was 27 years old, when he enlisted for the duration, selecting Air Crew, as either Pilot or Observer. On October 7, 1940 AC 2 Stuart was on his way to No 2 Manning Depot Brandon, Manitoba. His basic training at No 2 Manning Depot would convert Stuart from a civilian to an airman. Posted from No. 2 MD to No. 2 Initial Training School (ITS) at Regina, Saskatchewan. on November 28, 1940. It would be at ITS that the abilities of each enlistee were analysed and very heavy screened for the duties which would best suit them. Here the men were introduced to the Link trainer a flight simulator which showed if they had any abilities as pilots. Other testing and physical examinations determined if they were fit for aircrew. He realized his dream and was selected for Pilot training. His next posting was to No. 12 Elementary Flying Training School at Goderich, Ontario. Located on the shores of Huron Lake and close to other training bases at Clinton and Centralia; but miles away from large townssuch as London Ontario. Instructors, during this period of 1941 were mostly civilians working for the BCATP and their standards were high. These instructors did not want someone who could fly mechanically they looked for those who did it naturally, as if they, the pilot, were part of the aircraft. Many of the pilot candidates, LAC Stuart being one of them found that they would have to select other trades as they did not pass these instructors standards. 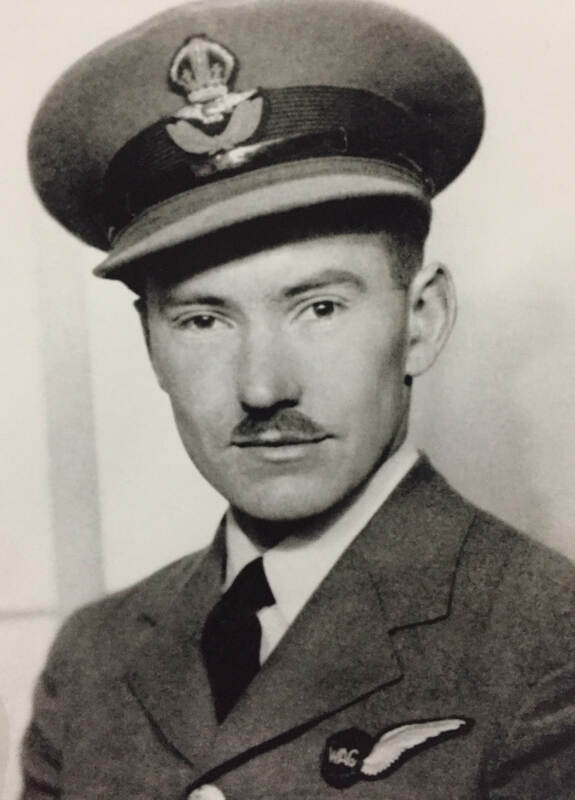 May 27, 1941 LAC Stuart was posted No 1 Wireless Station, Montréal, Québec, where he spent 5 months before being qualified as a Wireless Operator. The trade of Wireless Operator had been paired with that of Air Gunner. The WAG would take the place of an injured gunner during operations. To complete the second half of his trade skills he was posted to No 6 Bombing and Gunnery School (BGS), Mountain View, Ontario on November 8, 1941 . By December 6, 1941 LAC Stuart was awarded his Wireless Operators/ Air Gunners Badge. On December 8, 1941 LAC Stuart was promoted to the rank of Temporary Sergeant (T/Sgt). Before he could sew on his new stripes, he was commissioned as a Pilot Officer. Which was an indication that he had passed at the top or near the top of his class. On December 9, 1941, P/O Stuart was sent to No 1 Y Depot Nova Scotia. While on Leave prior to Overseas duties Stuart returned to Lakefield on December 10, and married Valerie Oliver in Lakefield, Ontario. He embarked from Halifax January 7, 1942, disembarked in the United Kingdom January 23, 1942. P/O Stuart then proceeded to No. 3 Personnel Reception Centre (PRC), England arriving January 24, 1942. March 18, 1942 P/O Stuart was posted to No 5 Special Service (SS). From March 19 to April 22, 1942 he successfully completed the No. 1 War Course. Then was posted to No 23 Operational Training Unit (OTU) on May 5, 1942. July 23, 1942 P/O Stuart was posted to No 419 "Moose" Squadron RCAF at Mildenhall, Suffolk, England, part of No. 3 Group of Bomber Command, Royal Air Force (RAF). Here along with WO Sidney Stowe and crew Stuart would fly eight operations. On his eighth operation, October 2, 1942 F/O Stuart and his fellow crew members were over Krefeld when the Wellington he was the Wireless Operator/Air Gunner on was shot down, with only one survivor. Just the day before Stuart had been promoted to Flying Officer. The lone survivor of F/O Stuart’s Wellington was Sgt Norman Nelan who stated that the aircraft was shot down over Holland on October 2, 1942. The crew were ordered to bail out at 2,000 feet. He bailed out first and when taken prisoner the Germans told him that F/O Stuart had been found dead in the crashed plane. Flying Officer Stuart, Wireless Operator/Air Gunner was buried at the War Cemetery at Uden, North Brabant, Holland. He also qualified for the General Service Badge. In 2013 Canada started to issue a "Bomber Command Bar" for qualified Royal Canadian Air Force aircrew members. This Bar may be received by a qualified family member of deceased Air Crew qualifiers by contacting Veteran’s Affairs Canada. Harding James Stuart served for 1 year and 3 months in Canada and 8 months and 9 days in the United Kingdom plus 16 days en-route to the UK for a total of 2 years.